The 8th AF flew its last combat mission on 25 Apr 1945. Within days, planners were working on a new operation for its men and planes. Called Trolley, the purpose was "to provide all ground (non-rated) personnel with an opportunity of seeing the results of their contribution in the strategic air war against Germany." Only by flying over areas that had been bombed by the 8th Air Force or attacked by Allied land forces could the ground crews really understand what their dedication and skill had helped achieve. 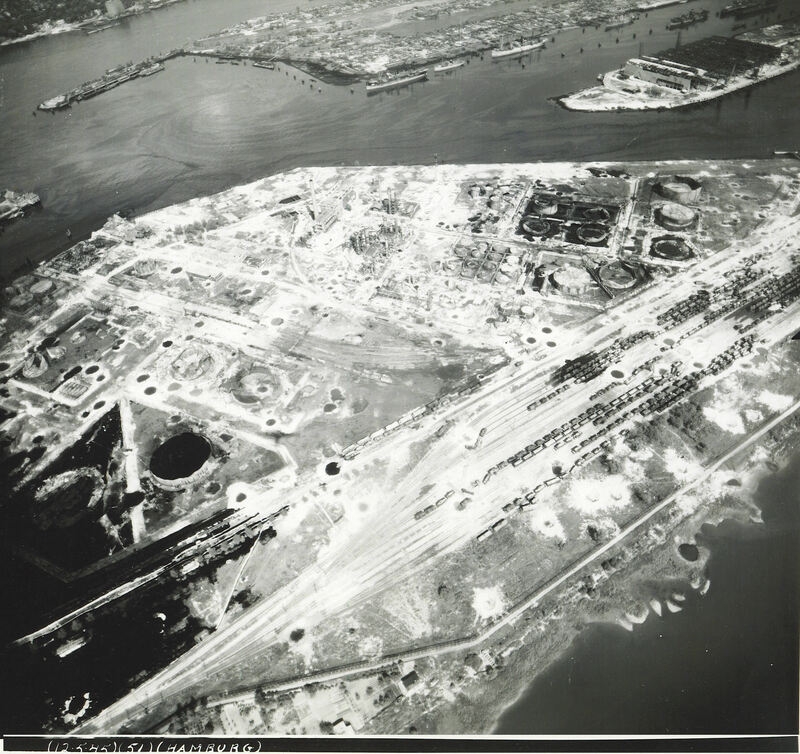 The Trolley flights were flown in early May 1945. By the time they ended, 450 airmen from the 392nd had flown over 2,000 of their own ground crew. They had also flown support personnel from the 3rd Strategic Air Depot at Watton, the 355th Fighter Group at Steeple Morden and the 491st BG. Many 392nd crews and several passengers made multiple trips. The rules were generally the same for each mission. Group commanders were told to "accord special attention to the selection of the most responsible and experienced pilots." Most of the 392nd pilots chosen were indeed veterans of many combat missions. A few, however, had arrived at the 392nd too late for combat. These included 2/Lt William E. Bledsoe, 1/Lt Paul J. Fenoglio, F/O William H. Rutherford, and 1/Lt John T. McCarthy, whose first missions over the Continent were on these sightseeing trips. Planes would have a minimum crew of 5 (pilot, copilot, navigator, engineer, and radio operator) with 10 passengers per a/c. Passengers would be issued chutes and Mae Wests; pilots would brief them on bail-out and ditching procedures and the interphone. Copilots would draw candy and return the bags at the end of each mission. 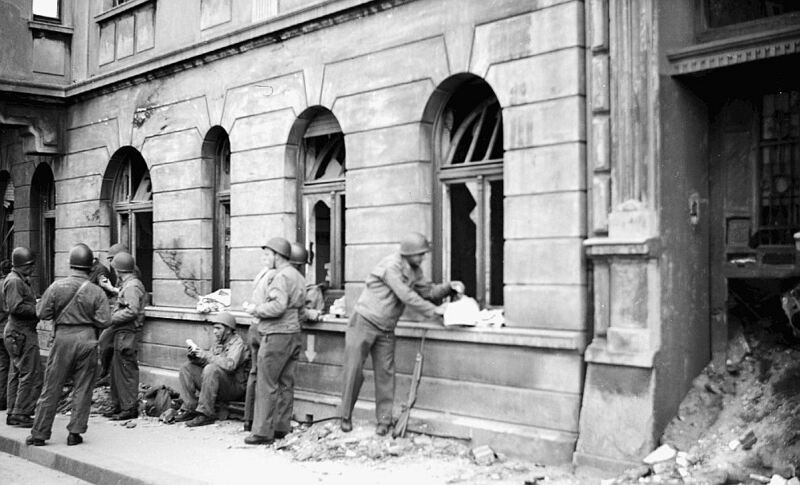 Additionally, Group messes were tasked to supply sandwiches for personnel since the trips generally took between six and seven hours. A/C would be dispatched in elements of 3. Within each Group, 10 minutes was given as the interval between take-off of the first and last aircraft. Once assembled, the elements would depart in trail at one minute intervals. 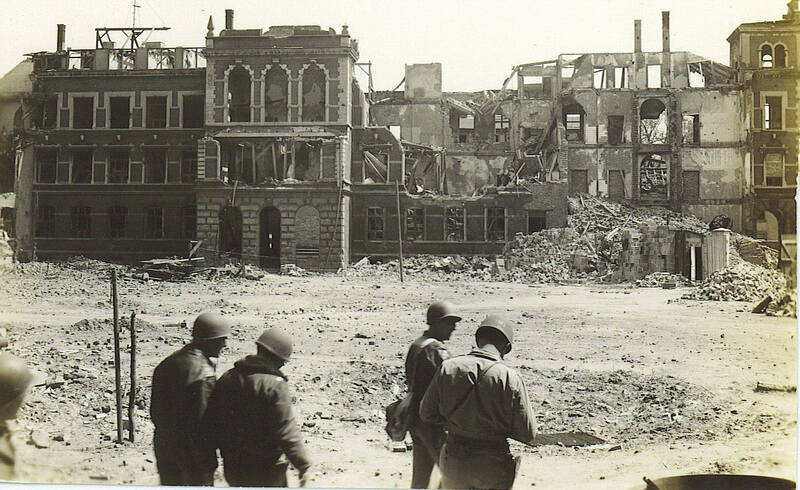 8th AF planners were greatly concerned about safety. Their teletypes stressed the "responsibility of the pilot to his crew and passengers " and "the deplorability of needless loss of life to carelessness, particularly now that hostilities in Europe are at an end." In the event weather would not permit the prescribed altitude, the entire mission was to be cancelled. The code word for recall was a heartfelt "Sorry." Despite these precautions, accidents did occur. 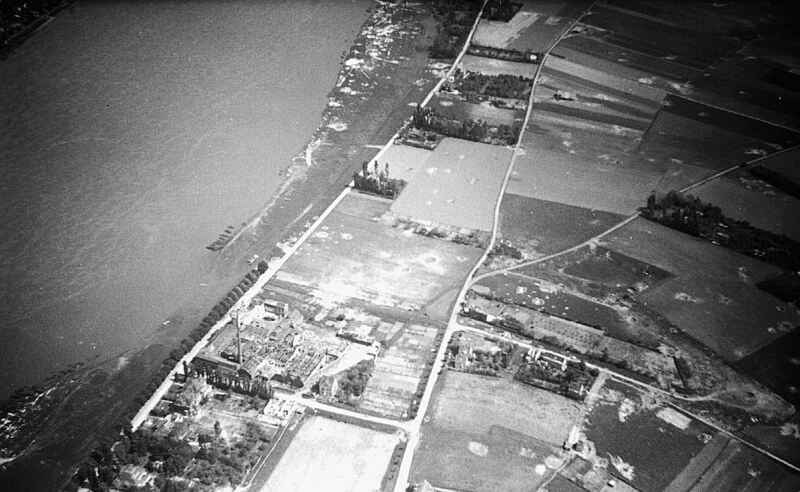 On 7 May, a 389th BG crashed into the Engers Bridge over the Rhine near Cologne, killing 19 men. 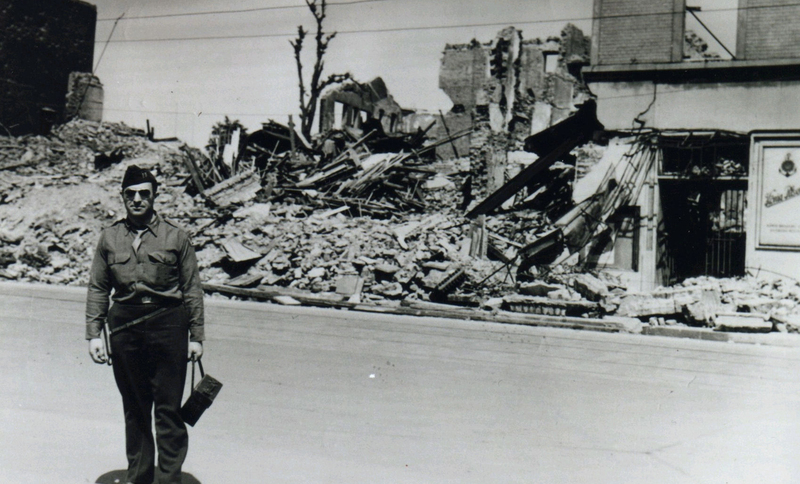 On 10 May, a B-17 was lost during an air collision over the UK with no known survivors. The route for this mission: Base to Southwold, then Ostend, Mannheim, Aschaffenberg, Frankfurt, Bingen, Koblenz, Bonn, Cologne, Dusseldorf, Brussels, Ostend, Southwold, and return to base. The 2nd Air Division dispatched 362 a/c. The 392nd was tasked to fly its own personnel in 20 a/c and 200 passengers from the 491st BG in another 20 a/c. At the briefing, pilots were told there be NO BUZZING and that Col. Cameron from the 44th BG was the observer. Pilots were warned that 240 B-24s were ahead of the 14th Combat Wing and that untold numbers of B17s were flying in the same area. 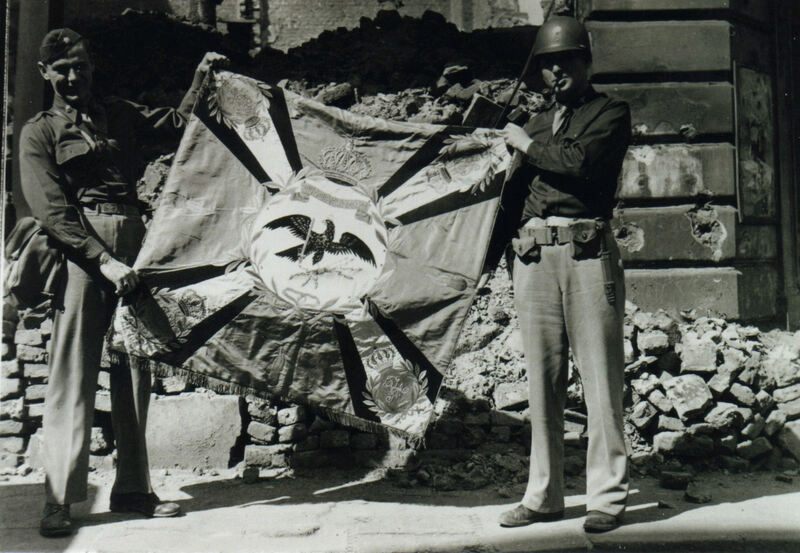 This mission was flown the day before V-E Day, so some 392nd BG crews included a gunner. The 392nd sent up 39 planes with 390 passengers. LtCol Cameron of 44th BG was in the patrol a/c. The route was the same. 330 a/c in the 2AD flew this mission; the route was the same. A/C were dispatched in flights of 6, flying in trail at a minimum interval of 1 minute per flight. Maj. Walsh was designated to fly as Command Pilot in the patrol a/c. The 392nd sent up 30 planes carrying its own personnel and 10 a/c for personnel from the 3rd Strategic Air Depot at Watton. A total of 670 a/c from the 8th AF flew Trolley missions, including 379 B-17s and 291 B-24s. Perhaps based on lessons learned from the first two missions, 2AD warned that "any violations reported of low flying (below 1000 ft above terrain) will be subject to severe disciplinary action." In its briefing, the 392nd announced that five pilots were up for court martial for buzzing the previous day, but did not say to which Group these pilots belonged..
Gen Johnson flew in the monitor a/c. The 392nd sent up 36 planes carrying 361 passengers. At the briefing, pilots were advised to be on alert for a/c from the 1st AD (383 a/c) and 3rd AD, especially around Bingen. "Some will be heading toward us–some with us." 2AD announced that weather permitting, 270 a/c would fly. A different route was announced for this trip: Base to Great Yarmouth, then Katwijk Ann Zee, Arnheim, Munster, Osnabruck, Bremen, Hamburg, Brunswick, Hannover, Bielefield, Hamm, Essen, The Hague, Great Yarmouth, and back to base. Pilots were told to "exercise especial caution at Munster and enroute through the Ruhr as these are the areas where the greatest concentration of a/c will occur." Passengers and crews were to be briefed on the entire route and "given a background on the important targets and attacks to be seen. Insofar as possible strike reports will be covered, indicating assessed damage to the targets." 2AD added a new instruction to their briefing teletype: "All personnel are to be briefed on the danger of throwing objects from a/c during flight. Nothing is to be jettisoned during the flight." The command pilots flying in monitor a/c now had to submit a "brief resume of conduct of the operation" to 2AD at the end of the mission. The 392nd sent up 32 planes carrying 342 passengers. Ten of the planes were designated for passengers from the 355th Fighter Group at Steeple Morden. That base transported its men to Bassingborne A/F. 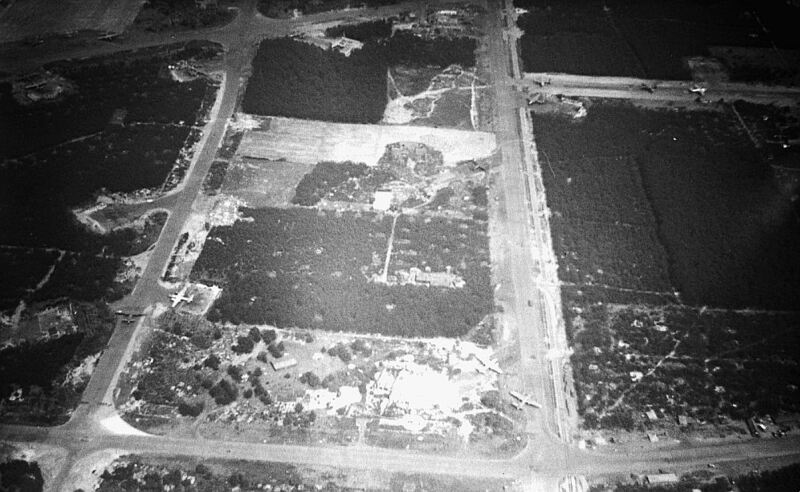 The 392nd's ten planes (with enough chutes, Mae Wests, and dinghies for the passengers) flew to Bassingborne, landed, and then taxied around to take off position on the perimeter. After pilots cut engines, they reported to Capt Kerr while crews remained with their ships. Pilots got their passenger assignments, prepared loading lists, and turned them in to Capt Kerr. At his direction, they took off from Bassingborne, departed to Orfordness, and rendezvoused with the formation. The 14th Combat Wing was in the control and observer a/c. By this, the sixth Trolley mission, 2AD announced a force of only 186 a/c. The route and instructions were the same as for the previous day. Maj. Keilman was in the monitor a/c. The 392nd was scheduled for 15 a/c carrying its own personnel and 10 a/c for Steeple Morden. 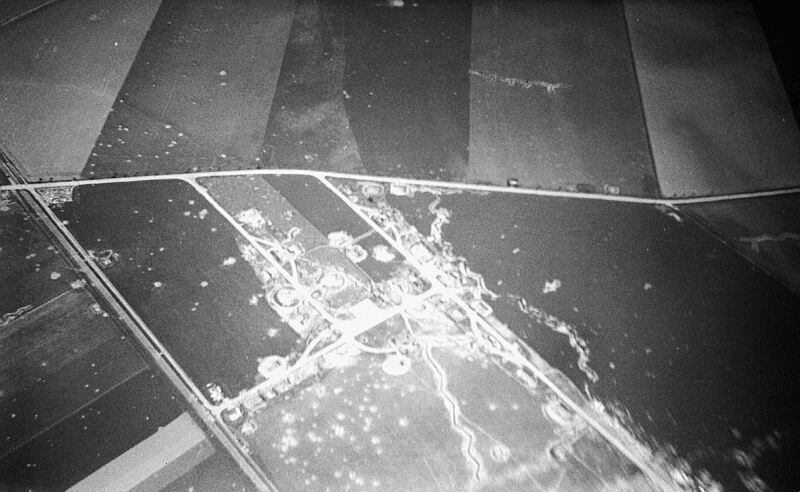 However, 2/Lt Rigney had to abort at Bassingbourn due to a prop failure and 1/Lt Harding's plane was not needed as he did not have enough passengers. 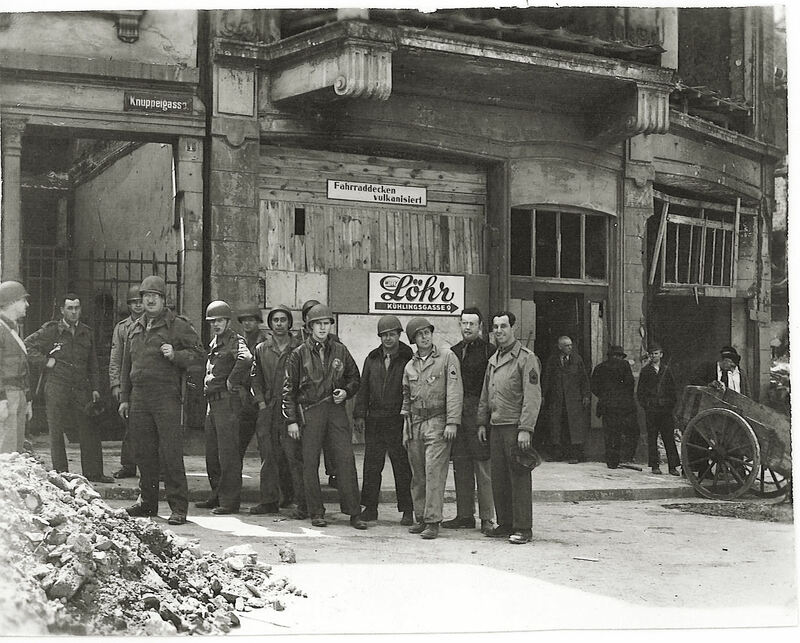 On 9 May, the 14th Combat Wing announced the Cooks Tour: An opportunity for outstanding crew chiefs and other maintenance personnel who had received the Legion of Merit or Bronze Star to visit bombed areas in Germany. The 392nd, 44th, and 491st would each provide 1 a/c with a minimum crew of 5 men. The ten passengers would include "1 engineering officer (to be in charge of EM) and 1 photographer." 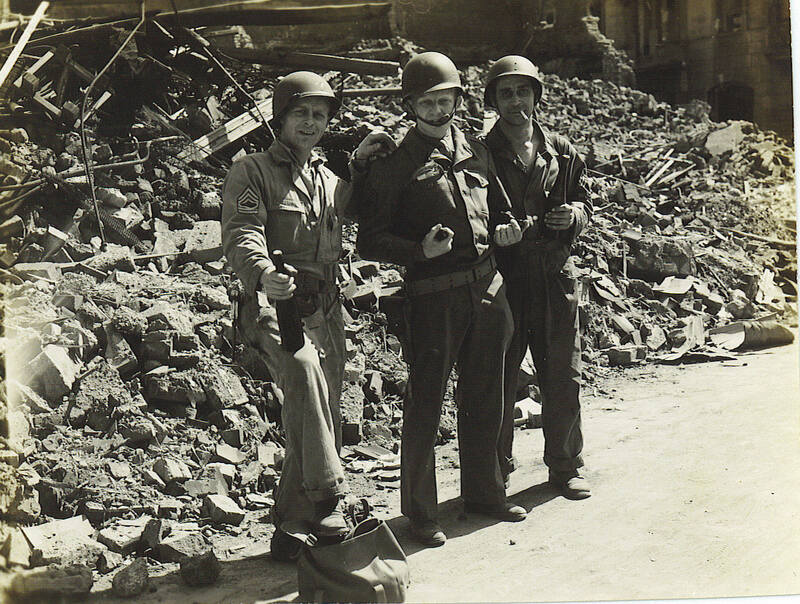 Each would carry 1 steel helmet, 1 carbine or rifle per EM or .45 pistol per officer, and K rations for one day. A/c for these special tours would take off from each Group at 0700 hours on 10 May and each day following until all scheduled personnel had gone. The a/c would fly from base to Southwold, then Ostend, Brussels, Liege, Duren, Cologne, and Frankfurt (via the Rhine River) and then land at station Y-55. This base was at Venlo, which straddled the border between southeast Holland and Germany. 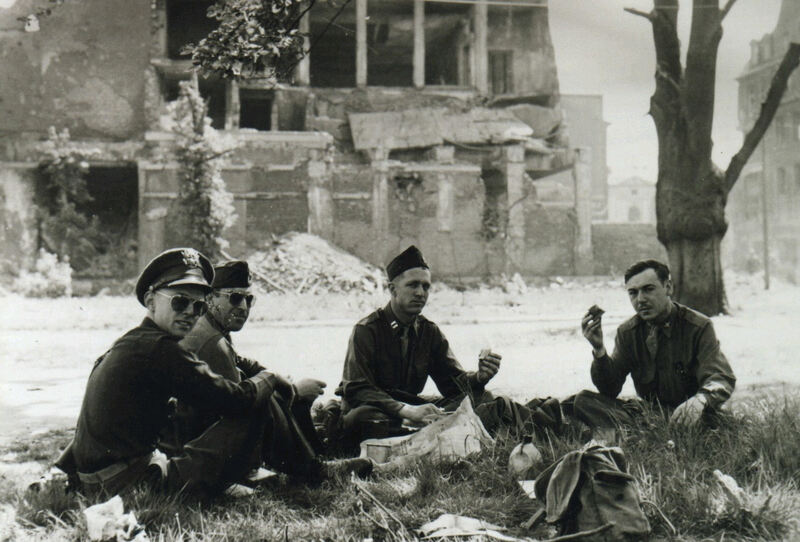 From Venlo, the men would be motored to Duisburg where they could walk around at their leisure and have lunch. Upon return to Y-55, they flew to Brussels, Ostend, Southwold, and back to base. 1/Lt Robert Vickers (578th Sqdn pilot) thought the "minimum of 1000 ft altitude" altitude applied only while over England. Therefore, he flew over the Continent at between 200 and 300 feet in order to give his passengers a good look at everything possible. He says, "These were fun missions; the war was over and no one was shooting at us. We all were determined to enjoy the sights and scenes and not from our usual high altitudes. We wanted our most dedicated Ground Crew types to relish this rare opportunity–and from all accounts, they did!" He also said every combat airman he knew was eager to fly these missions. 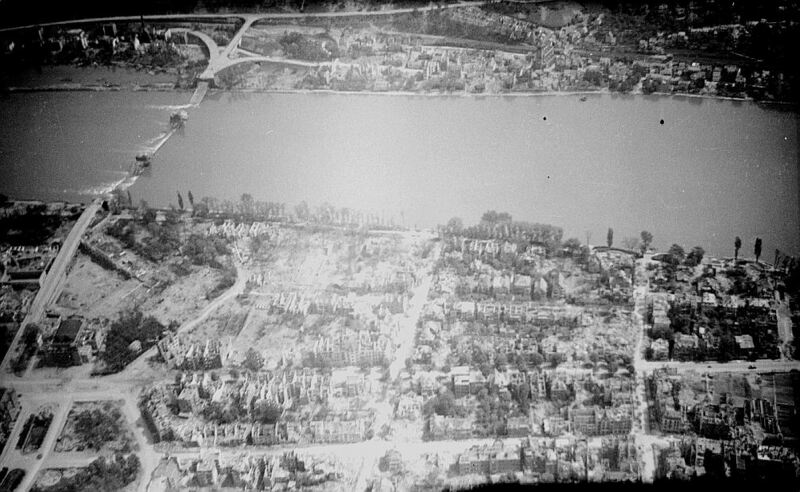 "After all, we had flown some very tough combat missions over many of these areas and cities and had lost a great number of our crews in doing so (Bingen, and the Ruhr targets to name but few) and we wanted to see first hand the awesome results, down low, where all could be visualized." 579th Sqdn pilot 1/Lt Oscar Weed and a few other pilots questioned why their entire combat crews couldn't go on the missions. (The command's response was that air crew members had seen plenty already.) Weed thought that wasn't fair because there was a big difference in what you could see from bombing altitude and the low altitudes given for these missions. As it turns out, some combat airmen did fly as passengers. Weed remembers hearing that one plane flew low and buzzed a German POW compound, rolling their tents up on the ground and blowing them across the field..
That pilot might have been 1/Lt Charles J. Jackson from the 577th Sqdn. 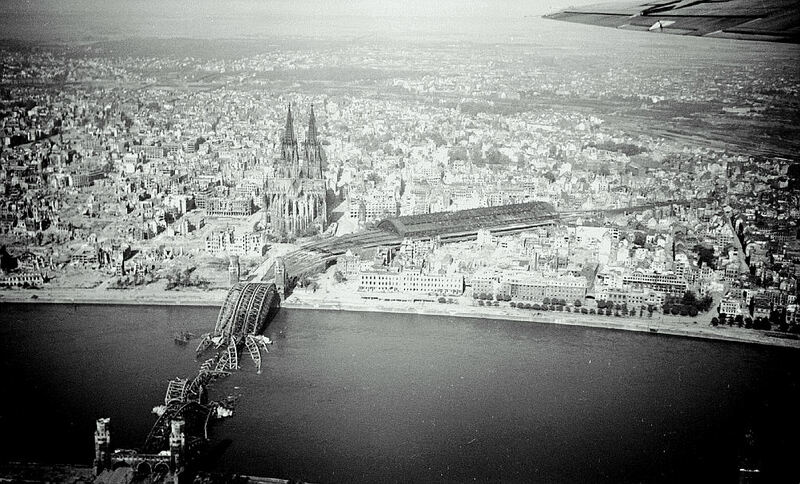 The route for the first Trolley mission he flew took them near the Remagen Bridge. Close by was a field filled with German POWs. As they flew over, a few of the prisoners taunted the fliers with Nazi salutes. That infuriated both crew and passengers. On his next Trolley mission, some of his passengers dropped trash on the prisoners. He remembers he got a "hell of a chewing out" but thought at the time that it was worth it. In his memoirs, pilot Walt Cranson wrote about his mission on May 8. He was delighted to be flying "on such a day–to see so many miles of celebration. Took along 3 rolls of toilet paper for my celebration... really makes confetti when unwound and thrown out in bunches. Had the boys in tail turret watch it–they could see it! ... Circled Brussels 3 times ... [with one crewman] shooting flares and me kicking off the toilet paper like mad. (Was reported Major Player saw it all and liked it! hm) Took off by ourselves ... and decided we wanted to see another big Capital celebrating, Yes, London! We found it–circled down to 400 ft. and I really dumped a lot out over Picadilly. Man were the streets packed, flags & bonfires everywhere. So low–could see the mob waving and climbing up on the lions of Trafalgar Sq. Home about an hour later than other guys, 8.15 p.m. Nice Day!" Everyone who saw Cologne Cathedral remembers it. 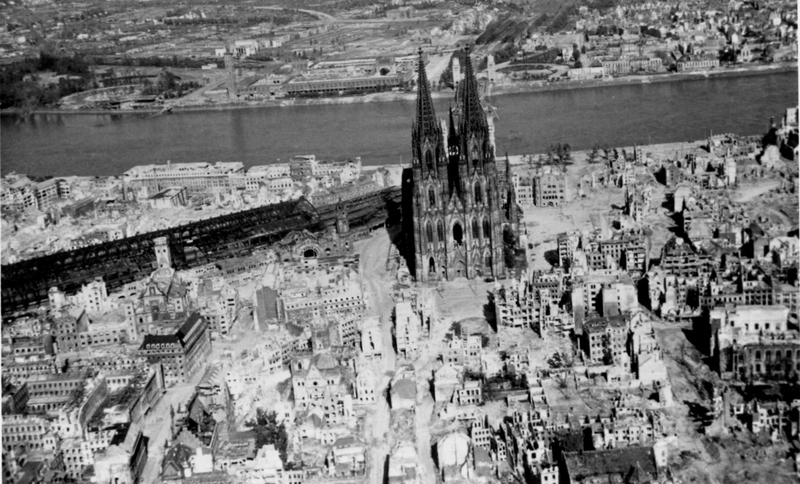 Vickers says, "Another memory etching view was the utter devastation seen around the areas of that city and especially around the remarkably statuesque Cologne Cathedral which was still standing with very little, if any, obvious damage to it! 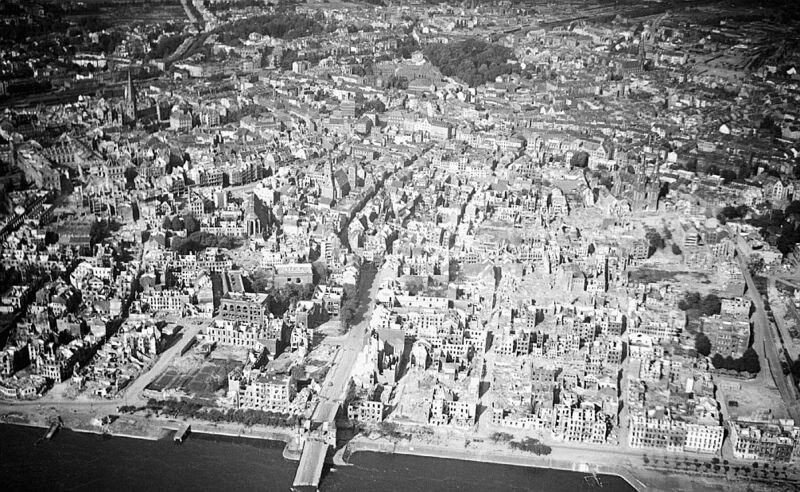 And, right directly across the street from it, one could see that the Cologne train station (the Bahnhof) and rail yards had been completely and literally obliterated from Allied bombing!! I am certain each of us privately wondered at the time (and perhaps even now) just what ‘message' of war which this scene offered." 1/Lt Walter Neustadt was an S-2 (Intelligence) officer in the 576th Sqdn. 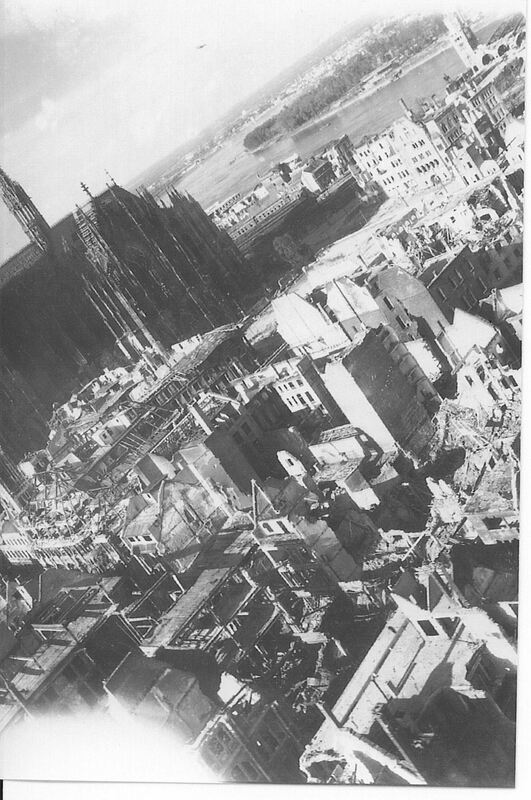 Cologne Cathedral, he recalls, had "no major damage to the building while the surrounding areas were totally demolished." Sgt Gil Bambauer spent the war as a parachute handler in the 576th Sqdn, becoming the NCO in charge of the Flying Equipment section. He boarded his plane on 8 May 1945 "with a sandwich in my pocket and a full canteen of water plus my chest type parachute." 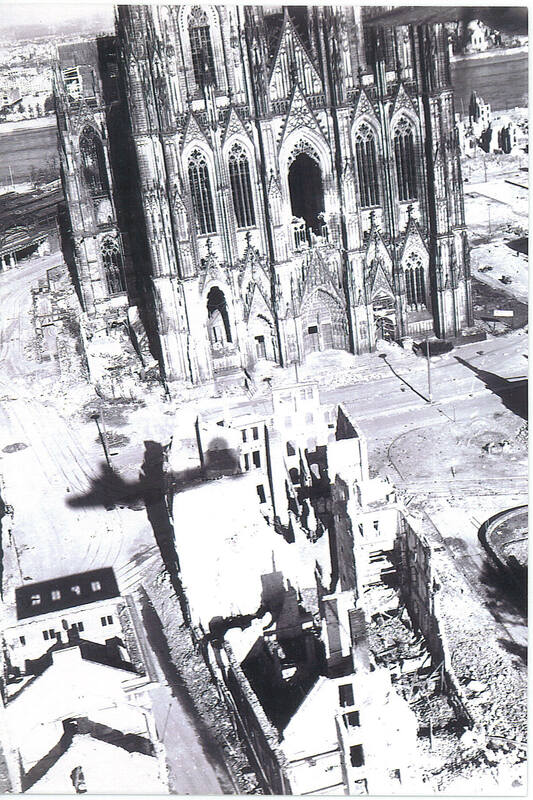 His pilot (1/Lt R.K. Crowell) descended as they neared Cologne and then flew directly over the Cathedral. Bambauer recalls that "The walls were erect but looked completely burned out inside. A small figure of a man seemed to be shaking his fist as the plane moved on." 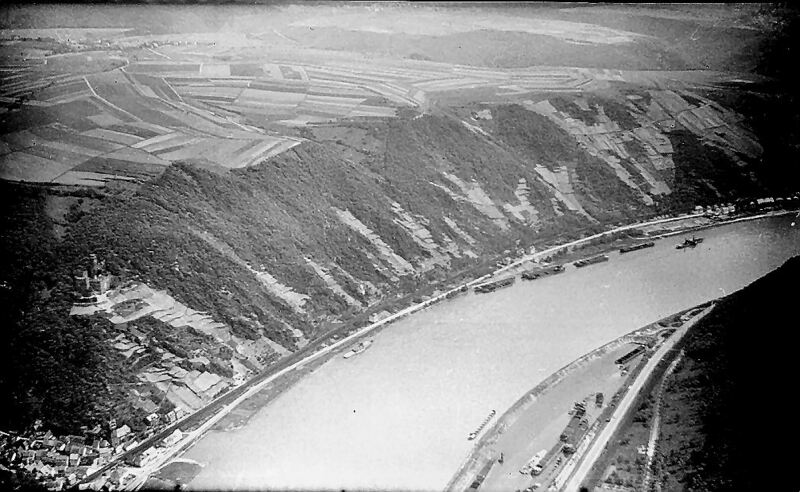 Vickers recalls, "As we flew low over the Remagen Bridge, with its spans down in the water, we noted some German youngsters on the banks throwing rocks up at us. Of course, we were in no danger, but the irony of it all struck all of us at this moment." Just down river from Cologne on the western banks, he saw a smokestack. Tall, intact, with yellow brick construction, it stood like a sentinel of a war gone by. Vickers clearly saw what was painted down the side of the stack in large letters: FORD. Weed still remembers, "When we flew over Belgium, the people looked up and waved. 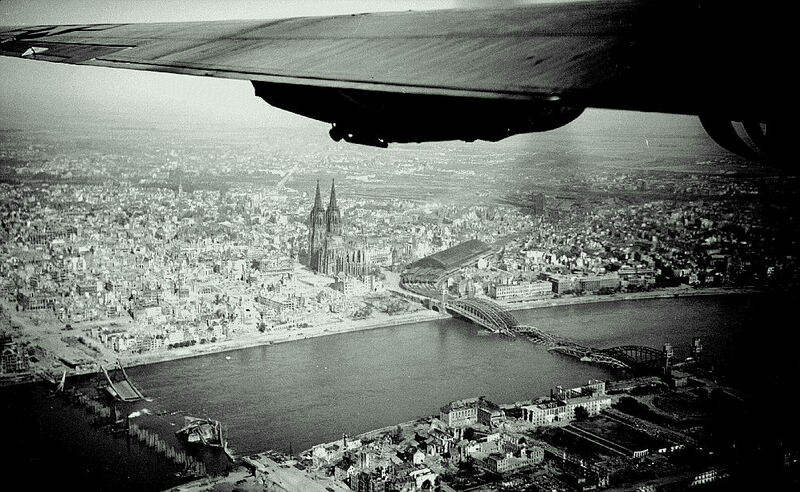 When we were over Germany, the people mostly looked down." What Harvey DeVoe in the Group's Photographic Section recalls the most is devastation. "There were huge areas of rubble. 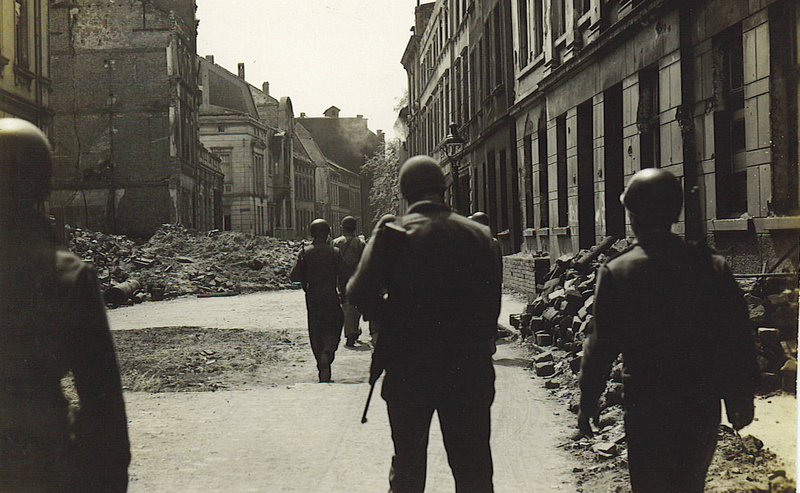 The buildings were just shells–no roofs, no windows, just walls with holes." Sgt Robert Harned was an Intelligence Clerk in the 578th Sqdn and maintained the target folders. He flew two trolley missions, on 7 May with Vickers and on 12 May with Vaden. He bunked next to a man in the Photo Lab who gave him a "GI camera" to take on his first trip. Harned positioned himself in the nose turret and took lots of photos. He says he took for granted that "after the ground and Air War people would know there would be a world of devastation. 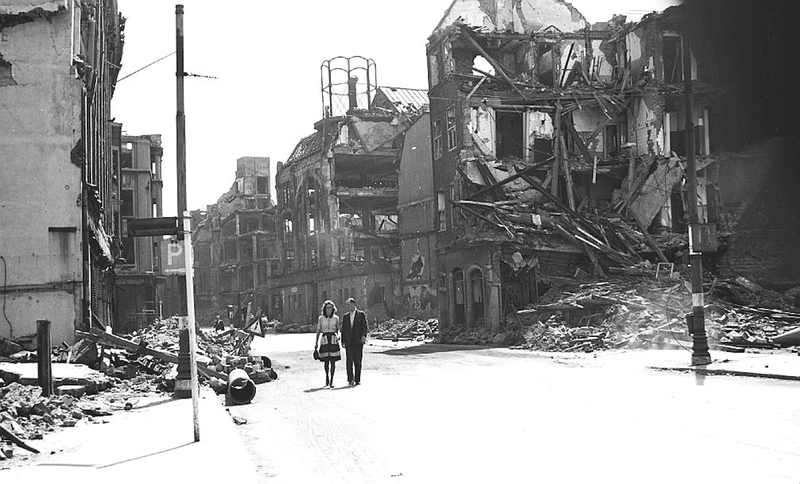 Maybe they would not, but it was everywhere: torn-up roads, knocked out bridges, bomb craters everywhere. 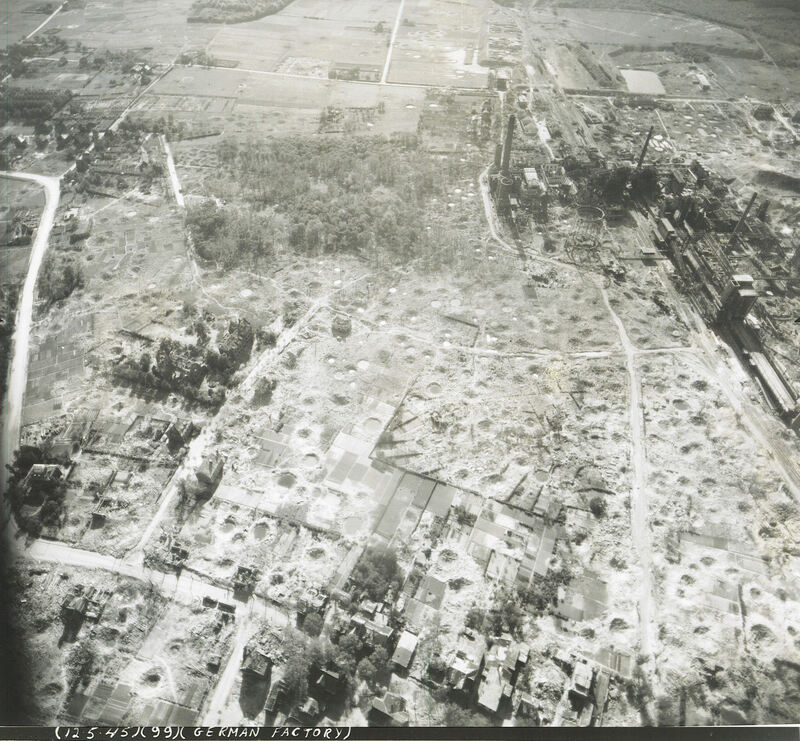 The towns varied from some, to lots of damage. I cannot remember any people walking around. Maybe they were still running for cover at the sound of the planes." As Gil Bambauer flew near the Black Forest, he thought of his great-grandfather who was from that area of Germany. When he returned to Wendling about 5 p.m., the Base was celebrating the Victory in Europe. After turning in his parachute and harness, he had a beer in the EM Club. After that, he had a light dinner and joined in the festivities. Pilot Oscar Weed flew trolley missions on 8, 9, and 10 May. He remembers three general reactions from his ground crew passengers: "1) very happy to see the destruction and that we had accomplished our mission; 2) very neutral without much reaction; and 3) horrified and sad that we had caused so much destruction and harm to people that had no responsibility for what their leaders had caused to happen." The men chosen for the Cooks Tour came from all over the base, but all had been recognized for meritorious achievement. As might be expected, many were crew chiefs or involved in maintenance of the B-24s. Others performed essential tasks that were more in the background. For example, Cpl Pete G. Kotsifakis was in the Avionics/Radio Support section. He was awarded the Bronze Star for his work with the Signal Corps on the Radio Bomb Release, which significantly improved bombing accuracy. T/Sgt George Pearson was a bombsight mechanic in the 10th Station Complement Squadron. He was awarded the Bronze Star for meritorious achievement from August 1943 to January 1945, including the invention of two "ingenious time and labor saving devices," one a Control Panel Tester for the A-5 Control Panel and the other an Intervalometer Thyraton Tube Tester. He took many photos while on his Cooks Tour. He recalls that once they got to Duisberg, they were left on their own to wander around. He also remembers that the officers managed to bring back a keg of German beer; he later heard that it tasted very bad. Pearson worked with 1/Lt Joseph E. Micksch, Jr., the 578th Sqdn Bombsight Maintenance Officer. Micksch was awarded the Group's first Bronze Star for establishing procedures for detecting damage on failure rates of new equipment brought overseas with the 392nd. He was also a member of the 578th Sq Carbine Team which won the base championship in Oct 44.